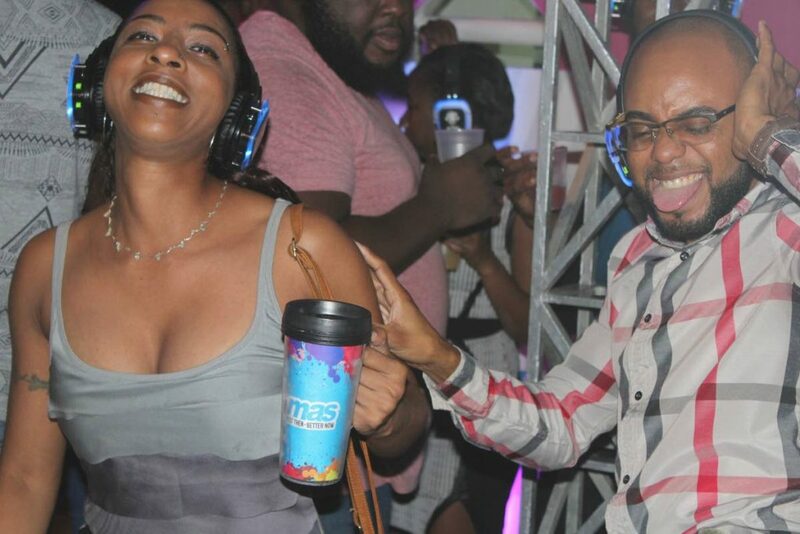 Silent party: Island People revellers dance to music on their headphones in a silent part at the promoter's headquarters on Tragerete Road, Port of Spain on Friday night. Photo by Enrique Assoon. 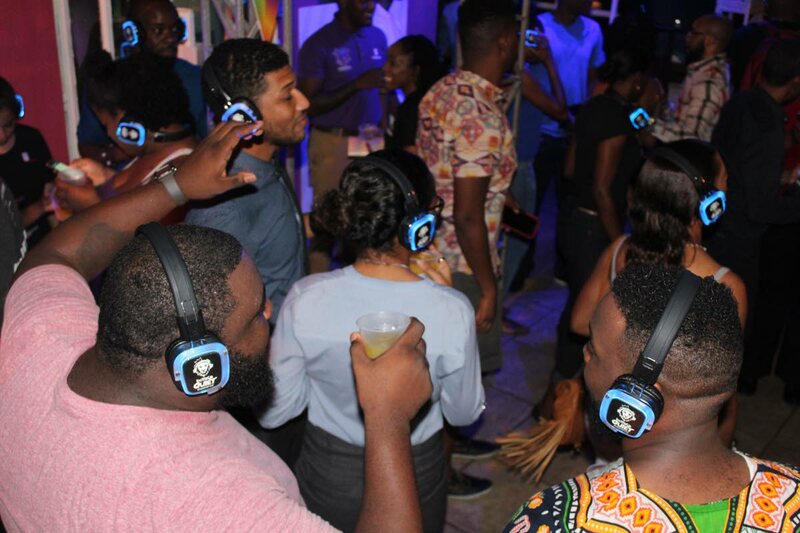 One events promoter has responded to the Environmental Management Authority’s (EMA) crackdown on loud music this Carnival season by going to the other extreme—hosting a silent party, replacing speakers with headphones without compromising on vibes. “It’s a pop-up event. It’s a response to something I feel is topical, interesting, and which I think could be the future of how we socialise,” Derek Lewis, founder and self-proclaimed chief inspiration officer of IPX, the events arm of Island People Mas, told Sunday Newsday. While not aimed specifically at the EMA, Lewis said, it is about acknowledging quality of life. “If we are disturbing the quality of life in a neighbourhood that becomes a situation we have to adapt to. But it is about mutually important things and if culturally we make noise at a certain time of the year then we can look at adapting and varying the amount of noise that is made,” Lewis said. And while silent parties are the extreme, it is an option. The party was held on Friday night, at the Island People Mas Camp on Tragarete Road, Port of Spain. For passers-by, it may have looked surreal—a throng of people, wearing headphones lit up in neon blue, feteing away in silence—all the wining and jamming one expects at a Carnival lime but with no noise. Kenywn “Titan” Gardiner, of Boyaka Quiet Experience, supplied the equipment. “It’s not a new idea, but it is a different but nice vibe,” he said. The headphones are wireless, and programmed with three channels that can each play different genres of music—or just one as was the case Friday. They are lightweight, and come with volume controls to adjust for comfort. Gardiner has hosted parties all over the Caribbean, with the biggest one in Guyana for about 1,200 people. He does, however, have 3,000 headphones in stock. Lewis joked that with no speakers, costs for parties could come down, even though there may be some additional costs for high tech equipment. He does note, though, that “feeling the music” is part of TT culture. “We can’t take that away. (Trinis) like to feel the bass and hear the sound so we need to come to something good for everyone. I like quality of life, and I wouldn’t want to be living in a neighbourhood with too much noise but it is Carnival. We are a Carnival people and we have to understand (loud music) in a cultural context,” he said. The goal then, is as events evolve, to find that sweet spot that balances culture, technology and experience. On January 13, the EMA cautioned Tribe bandleader and promoter Dean Ackin over the noise level at the popular Red Ants Stumped cooler fete at Queen’s Park Oval, Port of Spain. Red Ants in a release said the EMA police order to reduce the sound level compromised the fete experience for patrons. Reply to "Island People revellers fete in silence"